I’ve been doing minilessons around powerpoint and animation so that they don’t feel overwhelmed by the technology and I am trying to listen to their questions and then create the lessons around those concepts (sort of backwards design lesson planning). One team asked how they could create a television set with moving video, so I showed all the students how to use a Flip video and embed the video, using Paint to create the actual television set. When I realized that one group is really interested in singing songs and basing their story on High School Musical and Grease, I took some time to show everyone how to use Audacity. You can do audio right in powerpoint, but the quality stinks. Audacity for some of the projects where audio is front and center is a much better choice. One facet of the project is to link their book to the web, so we went over how to search for science-related sites and how to link to those sites right in their book. I then explained how you could easily create a Follow the Adventure story, with parallel story lines and paths right in powerpoint. I saw a few light bulbs go off, but I am not sure if anyone will give it a try. I need to remind them not to spend all of their time with the illustrations. Some of the artwork is fantastic, but we don’t have months to work on this project. Some students will get so caught up in the art that they lose track of everything else. Yesterday, my colleague Gail (who teaches kindergarten) brought in an end of the year book project from when my students were in kindergarten, and it was a nice connection to how we use art and stories for literacy. They got a kick out of seeing their old work, particularly in light of what they are doing right now. 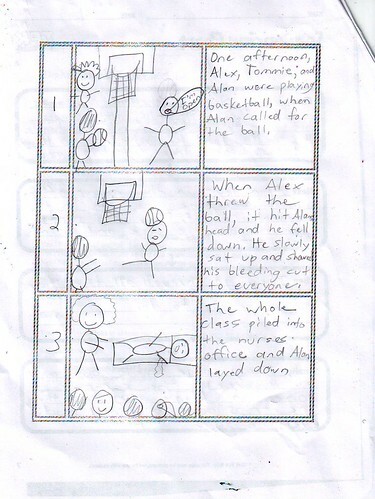 The storyboards have proven critical to keeping focus on the work. And I am having them write their draft of their stories in Word, so they can easily proofread and edit the story, before copying-pasting the text into powerpoint. A side benefit is that they always have a master file of their story in case something happens to the powerpoint book. I’m watching the students who have teamed up with others on this project. I warned everyone early on that they should not choose a partner who will be a slacker, and they did a good job. Two of my students who have proved themselves to be detrimental to group work this year were rejected (I monitored it closely), went off by themselves, only to be invited into a team by someone else. The surprise is that these two are working harder than I have seen them work all year, perhaps grateful to be asked into a team and realizing that their goofing off and inability to focus on work has a negative impact. I’m already thinking of more extension activities: using Voicethread to create an alternative version of their book (without the animation, so it will require some editing for a new medium); creating a webcomic review of their book; and …. any ideas? I am going to try to collect some of the digital artwork being done and create an animoto video montage — should be fun. Ken (aka, Blogger in Middle Earth) is taking the reins of Day in a Sentence this week, so please considering heading across the world to Ken’s blog and adding your thoughts. His theme this week is Day in a Comic, which could means a funny reflective sentence or, literally, a Day in a Comic. So, of course, I went the comic strip route, using ToonDoo for mine. I found this interesting resource: Comics created by the Government for their own purposes, such as information against the drug trade and health issues (makes for a possible discussion about rhetoric and genre, doesn’t it?). The ones I looked at seemed kind of odd and boring, but you never know what might be there. And just the fact that someone has collected them here …. the wonder of the online world, right? My friend, Chris (of The Graphic Classroom), just published his master’s thesis that looks at using comics for reading in the elementary level. I have to go through it and absorb his ideas, but the conclusion he reaches for his particular study seems to be that his use of comics did not impact the reading of his students. I imagine that must be disappointing for him, even if there were other benefits for him as a new teacher. And finally, here is today’s Boolean Squared, which was inspired by a rather dull and lifeless Professional Development session I was in a few months back in which the presenter droned on and on, and I noticed a few of my students smiling through the room’s windows at all of us. It was a perfect Boolean moment. Finally, my wife and son grabbed me a collection of free comics on Saturday during Free Comic Day. How about you? I’m in Denver, thinking about the web, while back home, a Duke the dog has joined our household, no doubt thinking about food. Art is already seeing something down the road … is it the light? Uh oh. As the year begins to draw to a close, I can see the light at the end of the tunnel. Lynn was hoping to lighten the mood a bit — seriousness followed by fun. Test prep has cooked us all – it’s time for some Friday games! wait a sec … is sara playing football? sara? is it bad that my own football coaches have asked me to buy armpads to lessen the panopoly of bruises i’ve collected? Summer poked its head into New England last week … hot hot hot …. and Mary saw its effects on her students. This week’s weather has been a rollercoaster ride of 900 one day and 600 the next, which sapped the energy of our most active students. Spring’s push forward brought some reflective moments for Eric. Our thoughts are with you. Keep the memories of good times with you, friend. Despite the trees joining the spring revolution with their blooming leaf flowers, this is a sad week for me as I celebrate my no longer here mom’s birthday. Mary Lee uses a good metaphor to catch the season and its pace. May approaches ever so slowly (snail style)…then WHOOSHES past (gazelle style) before we can process the fact that it is finally here! It sounds like Matt is sitting in an intriguing position. I’ve gone from no options to too many. Bonnie has returned from her annual sojourn to Israel and quickly got back into the teaching. I’m back from Israel, embracing jet lag and deal with my no service Iphone before I hit the road to Dover Middle School for lots of 6th grader digital stories to push to the finish line. I’m exhausted just writing into my day, but it’s good to be home, no matter what! Larry sounds a bit like me. And you? Barb, like so many of us, is looking ahead and balancing the calendar with tasks and finding one comes up a bit short. Wondering how everything is supposed to fit before the end of the school year, trying to compact and compile, dealing with antsy students taking the Indiana achievement testing again for the third time this year, I finally got my PGP for teacher evaluation summarized last week and I am beginning to see the “light at the end of the tunnel”. Oh, beautiful spring! Gail P. is making the adjustment back. Somewhat. Mind and body are lagging after a wonderful week in the American Southwest. Wondering if I should stop following my fall student teacher on twitter when she starts to give her a place to ask questions and complain about me without having to worry about my reaction? Not one single meeting after school hours this week; have I entered the Twilight Zone? Anne M. had a special moment — a special connection with her son recently. While I’m not averse to verse I’m versed out. And Cynthia brings a smile to my face (as usual) with her devious plans for sweet revenge. The seniors skipped school Friday, but do I have a surprise for them when they return to English class Monday: we will be together two periods in a row because I’ve agreed to help out a teacher who’s wife is having surgery and we will finish Macbeth before the fifth hour bell rings. PS — Ken will be the host for Day in a Sentence this coming week. Here in Denver, as I work on the visioning process for redesigning the website of the Western Massachusetts Writing Project (now projected to be a year-long inquiry collaborative endeavor and not a solo journey), we were asked to create a visual metaphor of the work of our writing project site. 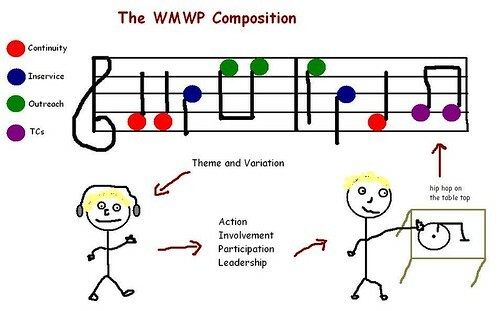 I turned to music and thought of our site as its own musical composition, with different elements of our site (outreach, continuity programs, inservice opportunities) working together to create a piece of Theme and Variation (ie, writing is at the heart of how we learn), but the door remains open for innovation and new elements of the composition. The DJ here is a new teacher, with new ideas, and how they can help keep us fresh and informed and invigorated with new sounds. PS — I had a fun time out and about in Denver last night with Bud the Teacher and a few other new friends. We went bowling (!) in a place with huge video screens showing modern art, played pool and talked on a range of topics from digital identity (hmmm .. Boolean Squared material) to leadership and advocacy in schools to the possible changing face of education towards virtual schools. I flew to Denver, Colorado, yesterday (impression: it seems flatter than I imagined) for a weekend visioning retreat in which a number of us from various sites of the National Writing Project are working to consider how an organization presents itself on the Web in a coherent, inclusive and relevant way for its audience (for us, teachers) and the general public. Our aim is to do inquiry this weekend into our organizations (mine is the Western Massachusetts Writing Project), work through some essential questions and then map out a plan for collaborative planning around the content and design/redesign of websites that will better reflect our sites. We began last night with prewriting and discussions. Among the things we were asked to do was to brainstorm what “web presence” means to us and then work on coming up with a visual metaphor for this understanding. I pitched the idea of a Talent Show, in which the public sees a variety of different concepts and ideas but behind the scenes, there are a lot of people collaborating on the show. In the end, our group chose the metaphor of a huge eye, with the eye representing “vision” and also a list of “i” words such as a inquiry, inviting, insightful, inclusive, etc. That worked for me, too. At the other tables, the metaphors included: an interconnected table of people, holding hands and connected through many nodes (think a modern version of King Arthur’s Roundtable, with no king); a portable children’s museum that has exhibits that invite participation (not a static museum where you can’t touch anything); and a metaphorical walk through the woods, with trees and the road representing elements of inclusiveness. It’s all very fascinating, particularly if you push these ideas into digital identity of people (as one person said last night, we’re all cool on the Internet) and consider audience, design, and more. 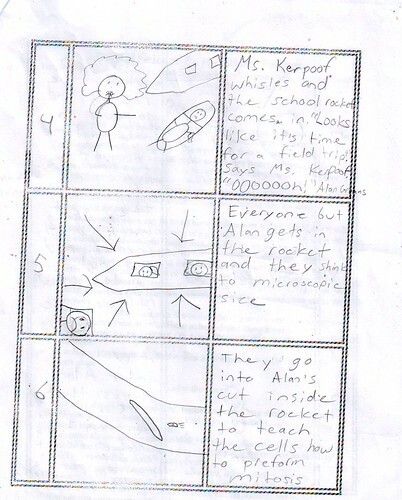 I have found that pre-writing is a key to quality of work from my sixth graders. They have to have time and a means to brainstorm and organize their thoughts before they rush into the actual writing. And when you add technology to the mix, this is even more important — otherwise, they get so deep into the technology, they forget to pay attention to the story. This week, as my students work on the start of a Digital Picture Book on Cell Mitosis, they are hard at work with two pre-writing strategies. First, they have to map out the storyline from beginning, middle and end. This plot design (in the form of a concept map tool) is something we work with a lot during the year, so it is now natural for them to “see” the whole story as it might unfold. I say “might” because I remind them that stories may change as they start the actual writing and better ideas come along or if they get a burst of new inspiration. The draft is not super-glue for the idea, just velco (hmmmm, not sure if that metaphor works, but I will keep it there for now). Next, they work on storyboards for their books, showing the sequence of events with both visual and written descriptions. This is not a time for all of the details that will go into the books, but it is a time for seeing the possibilities. 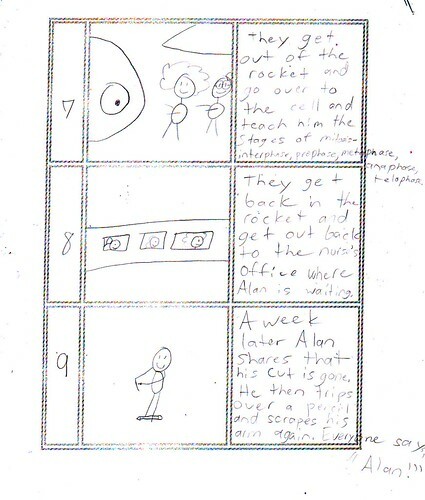 I like storyboarding because it allows me to have a good conversation with my students in a way that allows us to follow the story development visually. I can’t wait to see this one as a final book.